Our spring dig-in leader training is complete – stay tuned for our fall training. Contact us if you’d like to get involved sooner and join our frequent volunteer list for notifications of additional gardening opportunities. Dig-in Leaders are Green Corn Project’s most valuable resource! The more Dig-in Leaders we have, the more people we can help. We are always on the lookout for volunteers willing to take the next step and become Dig-in Leaders. No prior gardening experience is necessary. The workshop will train volunteers on all aspects of being a Dig-in Leader, from garden preparation and planting techniques to efficient management of volunteer groups. Those who attend a workshop will then get hands-on training shadowing experienced Dig-in Leaders during upcoming Dig-ins. The goal is to have workshop volunteers ready to lead their own teams by the next Dig-in season. Dig-in Leaders are encouraged to lead Dig-in teams on at least one, and preferably two days each fall and spring. Of course, those wishing to lead more teams each season are welcome to do so! 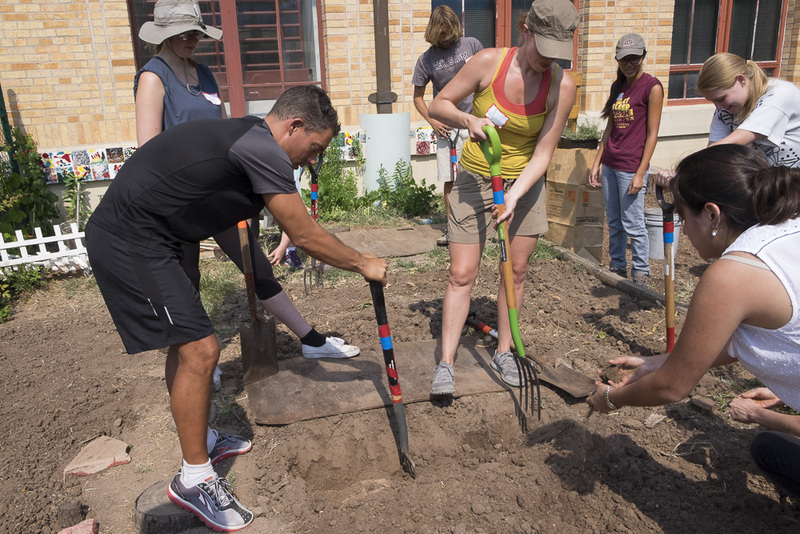 If you love Green Corn Project’s mission and want to be more involved to help us reach more people in need, while learning new gardening and team leadership skills, Dig-in Leader training is the place for you! Please be sure to check the website and your e-mail both the night before and the morning of the training, as it is possible that we may need to reschedule because of weather, ground conditions, or other reasons. Please bring sun protection, shoes with sturdy soles (digging in flip flops is no fun), water or other beverages, gardening gloves if you use them, and snacks or lunch if you want them. We will provide all the necessary tools and instruction, you do not need any prior training. Plan on staying till 1pm, although we may be able to finish a little before then. We will meet at Smith Elementary School located at 4209 Smith School Rd, Austin, TX 78744. Please arrive by 9:15am – the garden is on the far side of the school parking lot as you drive in.